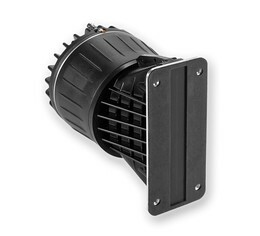 The BMS 4507ND dual diaphragm coaxial planar wave driver radiates a coherent planar wave front form a rectangular piston without internal diffraction for superior dispersion control and high fidelity sound. The driver is in fact a 2-way system employing two concentric annular ring diaphragms. Each driver covers a smaller frequency range for increased power handling, high dynamic and extremely low distortion. This distinctive new transducer was engineered to work with 6.5-inch (162 mm x 19 mm) rectangular throat waveguides providing extremely high sensitivity. The patented design of the BMS 4507ND is a result of extensive dedicated research and development providing dramatic improvement in dynamic response, clarity and transparency. The larger annular midrange diaphragm covers the frequency range between 400 and 6500 Hz with a smooth, linear response. The high diaphragm excursion of max. + / - 0.8 mm results in high output and increased power handling up to 1300 W peak. The ultra light annular diaphragm for the high range offers exceptional transient response with very high efficiency from 6 to 22 kHz. The voice coils may be driven in conjunction with a passive crossover or driven individually from an active crossover. The unique voice coil technology employs a light weight Copper Clad Aluminum wire wound inside and outside of the Kapton™ former to improve the heat dissipation, dramatically increasing the acoustic output and reliability of the driver while minimizing the power compression. The use of high grade neodymium magnets provide improved performance while significantly reducing transducer weight. The 4507ND is optimized for 0° to 15° vertical dispersion and allows a horizontal coverage up to 120° depending on the waveguide used. The unique design of the 4507ND dual diaphragm planar wave driver allows perfect acoustical coupling of individual units with excellent phase coherence and perfect time alignment to create virtually continuous line source.